If you’ve ever read Flatland by Edwin A Abbott, then you were well prepared for all the spatially abstract WTF-ness that this week’s episode of Doctor Who entitled “Flatline” brought to the table. “Flatline” had all the makings of a suspenseful/scary episode like “Blink” and “Listen”; but sadly missed the “relatability”. Though despite all this ‘wibbley wobbley… stuff’ ”Flatline” proves to be a powerful episode in terms of defining the Doctor and Clara’s ever-evolving relationship. We might not have understood most of the episode; but we certainly got to see how Clara and the Doctor have come to understand each other. At various times in Who History, we’ve heard the Doctor exclaim, “this planet (Earth) is protected”. Well this time around we got a slightly different take on it as the Doctor and Clara faced off against their dimensional adversaries. Similarly to the Tenth Doctor’s first episode “The Christmas Invasion”, Capaldi’s Doctor is dealing with an alien invasion; and isn’t afraid to kill one or two of them after the atrocities they’ve committed. I tried to talk, I want you to remember that. I tried to reach out, I tried to understand you; but I think that you understand us perfectly. And I think that you just don’t care. And I don’t know whether you’re here to invade, infiltrate or just replace us. I don’t suppose it really matters now. YOU’RE MONSTERS! That is the role you seemed determined to play so it seems that I must play mine – the man that stops the monsters. Here we once again find a demonstration of who this new Doctor is; but also who the Doctor always has been really. He might seem harsher and colder; but he is still the Doctor that cares as we learned last episode. He just has to come to grips with making the tough calls and knowing who can and can’t be saved. He’s forever the man who ‘tries to do good’ – as we learned in “Into The Dalek” -; but when he sees himself through another’s eyes, he starts to see just how cold some of his actions can seem. With the Doctor locked in the ever-shrinking Tardis, it’s up to Clara to act in the Doctor’s absence. Though this is much more than just a fun role reversal as we find both Clara and the Doctor learning what it fully means to be the Doctor. When Clara was trying to figure out how to keep everyone alive, the Doctor pointed out that now she knows how it feels. Though the tables turned when he asked what she was going to do next and she realized she’d have to lie to them and make it seems as though hope was still alive in order for them to run faster and fight harder. This shocked the Doctor as he realized that this is what he must sound like? In a rare turn of events, we got to see one of the few times – recently – that the Doctor is able to tell a companion how they were and how much they’ve meant to him. The Doctor’s message once again mirrors a Tennant situation in which he was trying to say goodbye to Rose only to have the line drop before he said what he wanted to say. Though this time around he gets to commend his companion for how they were – especially this time since Clara was being commended on being ‘the Doctor’. In the end, it’s not Clara’s goodness that makes her the Doctor; but her ability to make the hard calls and be clever. She knew the ‘boneless’ had gone around flattening a lot of door handles, so she tricked them into 3Ding a painting of a door handle with the Siege Tardis behind it. This allowed the Doctor to send them all back to where they came from. Being the Doctor might make you the clever hero; but it also means that you must sometimes give a harsh truth – harsher than you expected – and that is something both the Doctor and Clara learned in this adventure. After not seeing/learning much of Missy lately, we finally got to see this mysterious lady for a brief moment looking upon Clara and exclaiming how she chose well. What? How? Why? Well if we calm down for a moment, we can actually learn something from this as well as get an insight into where Missy’s allegiance might lie. 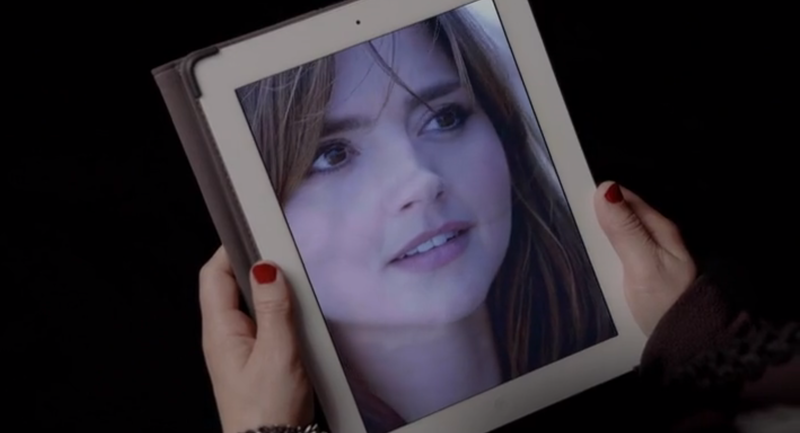 Earlier in the episode – when asked “who she is” – Clara remarks, “I’ll tell you who I am. I am the one chance you got of staying alive. That’s who I am!” In the situation at hand, those words were true; but if we take a wider glance then we see that that is who Clara always has been – especially concerning the Doctor. Unlike prior companions who more often than not become the damsel, Clara has saved the Doctor countless times – literally if you could her jumping into his time line – and continues to do so. In this episode itself we see how Clara saved the Doctor from an almost inescapable situation. That is when we realize that the things Clara did – and always does – that Missy could be proud of is keeping the Doctor alive. 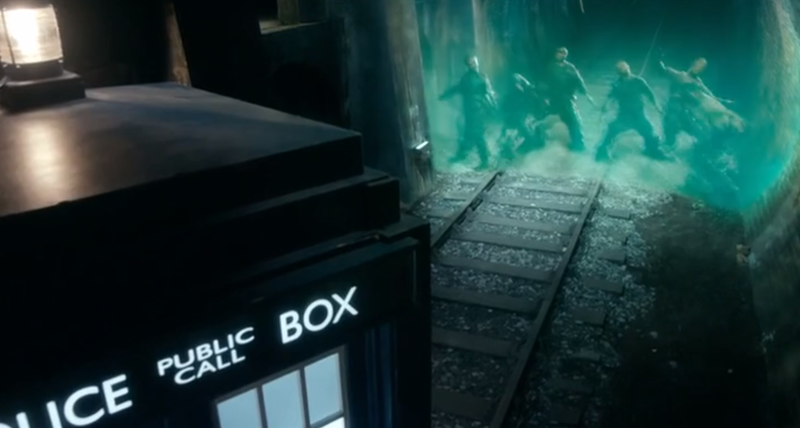 If Missy “chose well”, then that means that Missy is the one who gave Clara the number to the Tardis way back when. As for how Missy got the number and her grander plan at large, that we still don’t know; but right now it seems like Missy is actually a benevolent – albeit creepy – soul. We knew Clara’s little lie about Danny being fine with her traveling with the Doctor would unravel. 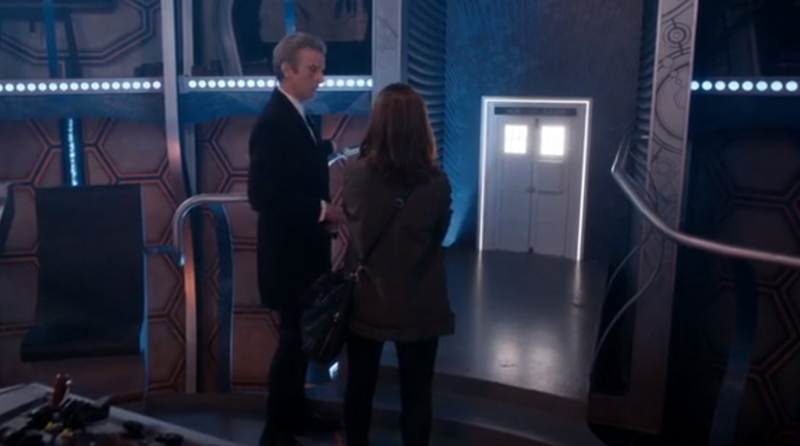 From the episode’s get go we can see her already fumbling for an explanation as she is removing her stuff from the Tardis – another homage to the ‘boyfriend’ motif – but saying everything else is fine. The Doctor soon finds out that she’s been lying an comments upon how despite being a good survival skill, which certainly came in handy for the mission, it’s a bad habit. The Doctor seemed forgiving – especially considering what they’d just been through – but Danny might not be. As if things weren’t strained already, she ignores his call at the end of the episode by saying ‘she’s in a meeting’; but considering the last time she called, that’s a BAD response. When he first called her, she was in a panic trying to swing to get out of the room the ‘boneless’ were 2Ding. 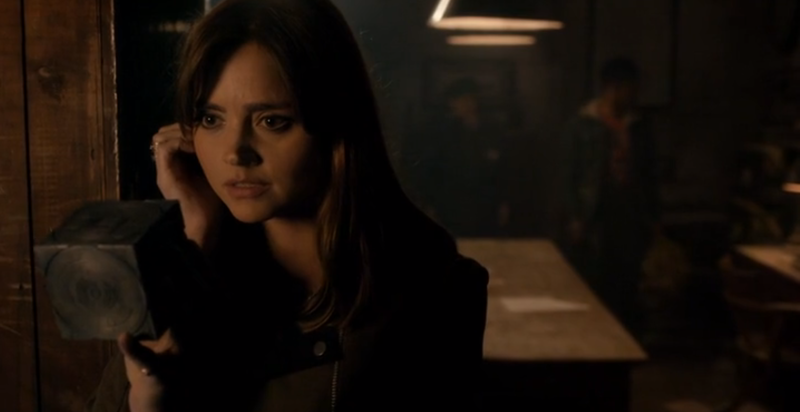 Though between the voice of another man and Clara’s heavy breathing, the phone call sounded a bit sexual. This of course all changes when the sound of glass shattering is heard and Danny wonders if she’s in trouble; but the damage is done. Danny knows she’s lying about something and each lie Clara makes just paints a worse and worse picture of what’s happening. Beyond all this, I really can’t try to explain the “boneless” and how they got here or could leach/transform dimensions. Additionally, the old man in this episode again struck me as an odd placement. We knew he was narrow-minded and pigheaded; but for the Psychic Paper to not work on him shows a real level of unimaginativeness. Do I think there might be more to him, perhaps? There’s been a lot of out-of-the-ordinary characters lately who might have a bigger role; or maybe I’m just hoping for there to be another growing force besides just Missy. Either way, next week’s episode looks to be the strangest yet as they find London completely overgrown in a forest. The preview doesn’t explain much; and initially paints a sort of ‘red riding hood’ vibe. So I guess we’ll just have to see where it goes.